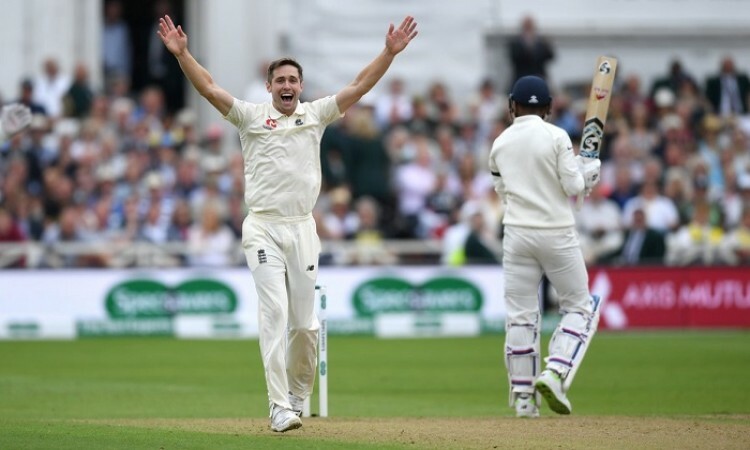 Nottingham, Aug 18 (CRICKETNMORE): England bowling all-rounder Chris Woakes continued his rich form with the ball by taking three wickets to spoil India's decent start and leave them reeling at 82/3 at lunch on Day 1 in the third Test at Trent Bridge here on Saturday. Woakes (3/18) accounted for the wickets of Shikhar Dhawan (35), Lokesh Rahul (23) and Cheteshwar Pujara (14) in a brilliant spell of seam-up pace bowling. Skipper Virat Kohli (batting 4) was at the crease at the break. After a batting debacle at Lord's in the second rubber, India openers Dhawan -- back in the mix in place of Murali Vijay -- and Rahul got off to a watchful start and stitched together a partnership of 60 runs. The pair saw off the dangerous James Anderson and Stuart Broad well with the occasional edge off Dhawan's bat finding the fence. The left-hander glanced Anderson down the leg side for the first boundary of the match before playing an iffy shot that took the outside edge of his bat to fly over the slip cordon and race to the third man fence. Rahul took eight balls to open his account but looked the more elegant, driving a Broad delivery outswinger for his first boundary and then playing an exquisite cover drive off Woakes. Just when things started to look good for the visitors, Woakes found Dhawan's outside edge with a good length delivery that squared up the batsman and the ball flew to Buttler at second slip. Rahul perished soon after, Woakes trapping the right-hander in front of the wicket though on Pujara's insistence he reviewed the decision to no avail. Pujara played two good looking fours but at the stroke of lunch holed out to Adil Rashid at long leg uncharacteristically. Brief scores: India 1st innings 82/3 (Shikhar Dhawan 35, Virat Kohli batting 4; Chris Woakes 3/18) vs England.